I never thought I would visit the edge of the Arctic Circle in the dead of winter. Nope. I never thought I’d brave -40 degree temperature either, but I did. You might too if you had the opportunity to see the Northern Lights in Churchill. Yes, they were amazing. Beyond amazing, but my trip was more than the lights. Not only did I see the night sky dance with majestic ribbons of green and purple light, but I spent three days in the northern Canadian town of Churchill, a place where I discovered a few Arctic adventures. Officially known and branded as the “Polar Bear Capital of the World,” it is a place where polar bears out number people (1,000 to 880) at times. However, my visit was in March, when the polar bears were far away from town (hunting seals on the ice of frozen Hudson Bay). Polar Bear season is October and November while winter is prime Northern Lights time (when it’s darkest). On my trip, I also learned about the Beluga Whale migration takes place in summer. Visitors have a chance to swim (or float) beside 100s of whales and hear their songs. That will be my next trip Churchill – sorry Polar Bears. 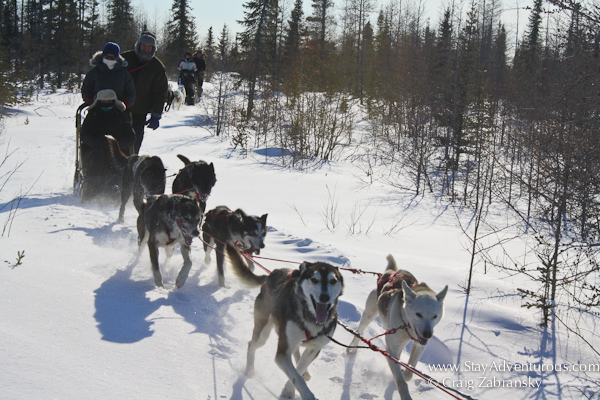 One activity, a highlight of the daytime adventures, was definitely the dog sledding adventure at Wapusk Adventures and the chance to take a winter ride and mush across the Arctic landscape. At Wapusk, Dave Daley the legendary local racer tells you about the care (the love), the history, his competitive race history, all before he explains how to prepare for sledding with his dogs. Many people wonder if the dogs can handle the cold weather, is it safe? Humane? All I can say is I’ve never seen a happier bunch of dogs wanting to pull a sled. My only complaint was that my first ride was too short as Dave and his crew needed to pack up and head out for the Hudson Bay Quest shortly after our visit. Next time, I hope to brave the elements longer. How does one travel across the frozen landscape, stay warm, and navigate large ice hummocks en route to adventure? By Tundra Buggy of course. These large people movers designed to brave the elements also provide a sense of luxury in the Arctic ice world. The one from Frontiers North included two fire places, a functioning bathroom, Chesterfield couches and space for all your gear. 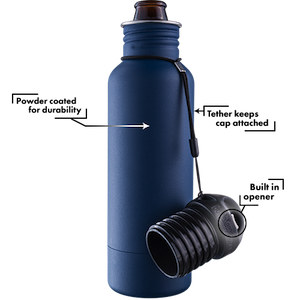 Also loaded with supplies such as water, hot chocolate, snacks and even at times of celebration (after viewing the Northern Lights) a few adult beverages too. We took the Tundra Buggy across the terrain at night to find a dark viewing location for the northern lights, but we also took the Tundra Buggy out for a spin one morning to visit a cabin and do some snow shoeing. The scenic stillness and silence of winter in snow shoes made a lasting impression. Beautiful. 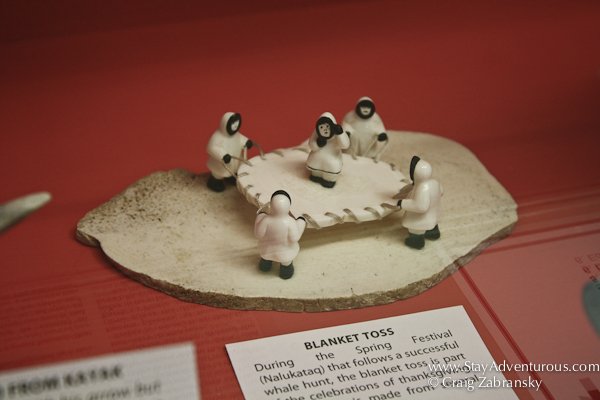 Eskimo is a term not often used publicly in Canada anymore. Apparently it is not a nice word. Who knew? 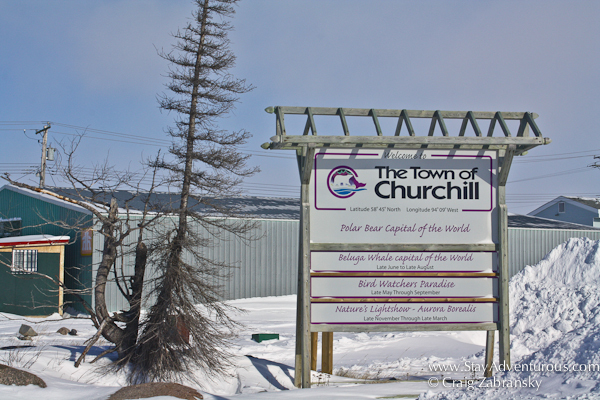 However, in Churchill it is still used as the name of the local museum (a surprise for some Canadians on my adventure) since it still best describes the culture and artifacts inside. The Assistant Curator gave us an overview of the Eskimo Museum and then we walked through single floor looking at all the exhibits. This particular piece made me smile because it represented happy times and fun. 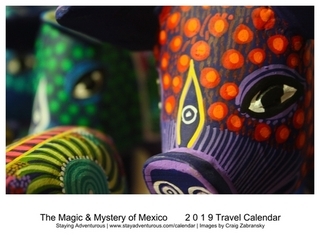 Although created for kids, all art or sculptures were small until the indigenous people started a more westernized lifestyle with permanent settlements. Big Inuit sculptures such as ones made from whale bone were just too heavy to carry in such conditions, they are essentially modern art. Just a few miles out of town at the Churchill Northern Studies Center science meets the arctic climate. There is much to learn and tourists can even take learning vacations and spend time at the center – it is not just for scientists. On our visit, in the most extreme weather conditions I’ve faced (until that evening when capturing the Churchill sunset) we exited the bus for a photo opportunity amongst igloos created by the Study Center. Foolishly removing my glove to take a photo on my iPhone, I felt the initial sensation of frostbite. We didn’t last long in the -45 degree cold with strong winds, nope, but we did brave it long enough to have photographic evidence. Sure Churchill will always be my Northern Lights, a trip that changed me and made me feel so alive, so wide awake. But I discovered more, I discovered a destination filled with Arctic adventure, many I enjoyed and some I want to return for when the weather is a bit warmer. 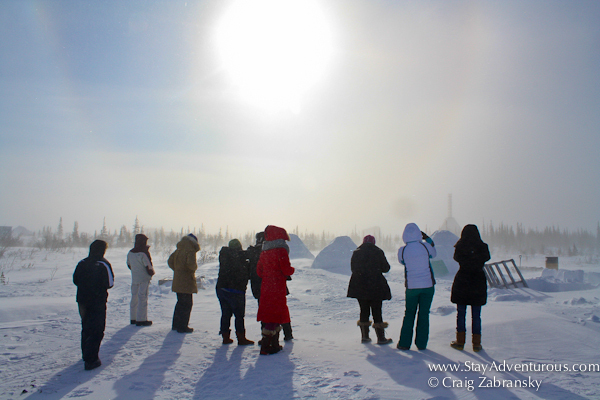 Special thanks to Travel Manitoba and Frontiers North for providing passage to the Arctic world in Northern Canada. « Super Bowl Sunset Sunday – Go Seattle Seahawks! this looks amazing! what a trip! definitely more of a beach girl over here, but to see the northern lights, this would be quite the trip! and i do have much love for oh canada! I hate the cold, which makes me appreciate people who live in the brutal extremes even more. I have a friend who once lived in Alaska. He has talked about how much those dogs love to work. People sometimes look at animals working and think they’re being mistreated. But that’s not always the case. I would love to see those sled dogs doing their thing. I had 15 days of Winter fun in Canada this past Christmas too. BRRRR is all I can say. I think you know I’m a fan of arctic adventures. Churchill is a dream trip to me. I’m in complete awe that there were TWO fireplaces in that Tundra Buggy! Churchill sounds like an interesting place. I bet there are some true characters among those 800+ hardy souls. I would love to hit a tavern or two in between these adventures. Loved Churchhill! And loved Bluesky bed and sled bed and breakfast. They made our stay in Churchill memorable! Jen and Getald Azure are amazing hosts. Two people with a heart for the land and a great love for there sled dogs. Once a sled dog retires they re-home the dogs and adopt them out to good families. 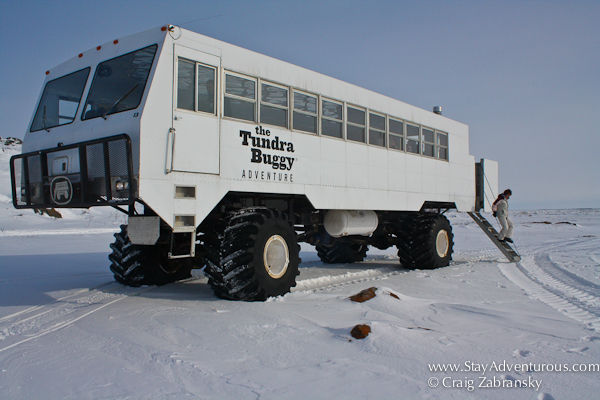 I want to take a ride on the Tundra Buggy! Oh, and I’m dying to see the Northern Lights. This looks like a great trip. Although seeing the Northern Lights is on my list, swimming with the belugas sounds like it just might top it. Great stuff Craig! OMG THE SNOW DOGS. sold. Hey man, so I’ve been looking in to the Churchill polar bear trips and there doesn’t seem to be one that isn’t super expensive. Did you notice any “budget” outfitters while you were there… or are they all pretty high? (like $500 per person for a day tour). As for cheaper adventures, definitely send your inquiry to the Churchill Northern Studies Center (see link in last photo)… they might be a great resource for budget travel.